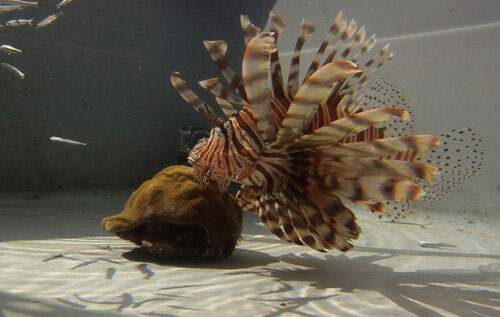 As Members may be aware, lionfish pose a significant threat to Bermuda’s reef fish stocks, and ultimately the reef ecosystem, as they feed heavily on local fish and invertebrates and have no natural predators here. Their presence also presents a risk to public health due to the painful stings that they can inflict. Lionfish were first reported in Bermuda in 1999. As their numbers grew and information was obtained regarding the threat that they posed, efforts were made to hunt and kill them. However, unlike other areas in the western Atlantic and Caribbean which are also being impacted by the lionfish invasion, relatively few lionfish were found in Bermuda’s shallow inshore waters. It was not until commercial lobster fishermen started catching lionfish more frequently in their offshore traps in the late 2000s and Triangle Diving personnel began seeing numbers of them on deep dives that we realised that they were increasing here primarily in depths greater than 150ft. We also realised that we knew very little about how large the population was, and how they were impacting local fish populations, and that this was important information to obtain in order to develop effective control strategies. This, combined with the realisation that no one organisation had the resources to handle this problem by itself became the impetus for collaboration. In October 2012, the Ocean Support Foundation, in partnership with the Bermuda Aquarium, Museum and Zoo (BAMZ), organised and hosted a workshop designed to help Bermuda start to create a plan to gather the necessary information and develop control strategies for this invasive pest. Dr. James Morris of the National Oceanic and Atmospheric Administration (NOAA) and Mr. Lad Akins of the Reef Environmental Education Foundation (REEF), two of the top authorities on the lionfish invasion in the western Atlantic, facilitated the workshop. The Lionfish Taskforce was established during this workshop with a mandate from workshop participants to oversee the creation of this Plan. Dr. Ian Walker, BAMZ/Department of Conservation Services. Mr. Jim Gleason, former TaskForce Chair and OSF Executive Director, and Ms. Helen Gullick, OSF Board member and Vice President of Contract Wordings at Ironshore Insurance Ltd., edited the Plan. The challenges of managing the lionfish invasion are complex. Lionfish are the first marine invasive reef fish to plague the western Atlantic region, so there are no previous experiences on which to draw. That is why this Lionfish Control Plan is so important. It provides a guide and cohesive long-term plan on how to tackle this problem based on experiences had so far in Bermuda and in the region. Although the Plan has just been completed this year, Taskforce partners have been far from idle during its development. In early 2013, the Taskforce initiated the submission of a Darwin Plus: Overseas Territories Environment and Climate Fund Project application to fund some of the main research components that had been identified early. A grant of just under £170,000 was subsequently awarded jointly to the Bermuda Institute of Ocean Sciences, the Ocean Support Foundation, the Bermuda Government Department of Environmental Protection, and the Bermuda Aquarium, Museum and Zoo in April 2013.
several education and outreach activities such as the BUEI lionfish exhibit, the BAMZ lionfish tank exhibit, a lionfish documentary and the Groundswell Lionfish Tournament. The Control Plan is a working document and will evolve over time as new information is discovered. The Plan represents the first stage of the overall control strategy and will provide a reference for anyone who is actively engaged in learning about lionfish and developing local control tactics. In closing, Mr. Speaker, on behalf of the Ministry of Health and Environment, I would like to thank all those who had a hand in preparing this Lionfish Control Plan. We would especially like to thank Mr. Jim Gleason for all the work that he did as Taskforce Chair to pull the Plan together and we would also like to welcome onboard the new co-chairs, Mr. Kirk Kitson and Mr. Paul Van-Pelt who will help guide the implementation of the Plan. The Ministry encourages anyone involved or wishing to get involved in the lionfish control work to download the Plan from the Government Portal (www.gov.bm) or the Lionfish Taskforce website (www.lionfish.bm). Upcoming opportunities for public participation in this effort will be advertised as widely as possible, and members of the public can contact the Lionfish Taskforce at info@lionfish.bm with any questions or comments.